Background and objectives Concerns exist about deleterious renal effects of low-carbohydrate high-protein weight loss diets. This issue was addressed in a secondary analysis of a parallel randomized, controlled long-term trial. Design, setting, participants, and measurements Between 2003 and 2007, 307 obese adults without serious medical illnesses at three United States academic centers were randomly assigned to a low-carbohydrate high-protein or a low-fat weight-loss diet for 24 months. Main outcomes included renal filtration (GFR) indices (serum creatinine, cystatin C, creatinine clearance); 24-hour urinary volume; albumin; calcium excretion; and serum solutes at 3, 12, and 24 months. Results Compared with the low-fat diet, low-carbohydrate high-protein consumption was associated with minor reductions in serum creatinine (relative difference, −4.2%) and cystatin C (−8.4%) at 3 months and relative increases in creatinine clearance at 3 (15.8 ml/min) and 12 (20.8 ml/min) months; serum urea at 3 (14.4%), 12 (9.0%), and 24 (8.2%) months; and 24-hour urinary volume at 12 (438 ml) and 24 (268 ml) months. Urinary calcium excretion increased at 3 (36.1%) and 12 (35.7%) months without changes in bone density or clinical presentations of new kidney stones. Conclusions In healthy obese individuals, a low-carbohydrate high-protein weight-loss diet over 2 years was not associated with noticeably harmful effects on GFR, albuminuria, or fluid and electrolyte balance compared with a low-fat diet. Further follow-up is needed to determine even longer-term effects on kidney function. Low-carbohydrate high-protein diets have been popular for at least a century as a weight-loss strategy. It was not until 2003, however, that they were studied in a randomized, controlled fashion. Many of these trials indicated that such diets produce greater short-term weight loss, similar long-term weight loss, and better improvement in certain cardiovascular disease risk factors (e.g., insulin resistance, HDL cholesterol) compared with a low-fat diet (1–11). Given longstanding concerns about the safety of low-carbohydrate high-protein diets on kidney function and health (12), it is surprising how little is known about the renal effects of such diets among obese dieters. Two studies that examined the effects of such diets on the kidney reported no adverse effects (13,14), although they were limited by modest sample sizes (65–68 participants); relatively short durations (6 months–1 year); a focus entirely on renal filtration and albuminuria; and, in one case, the use of a diet with significantly higher carbohydrate content than popular low-carbohydrate high-protein diets, like the Atkins diet (15). Important questions remain about the potential adverse renal effects of such diets from prolonged elevations in the GFR (i.e., glomerular hyperfiltration) (16,17); increased proteinuria (18–22); and derangements in electrolyte, acid-base, and bone mineral status (18). Unease over prescribing a low-carbohydrate high-protein diet takes on special significance in the obese population, where glomerular hyperfiltration, excess proteinuria, and a greater risk for kidney failure and other kidney-related abnormalities already exist (23–27). 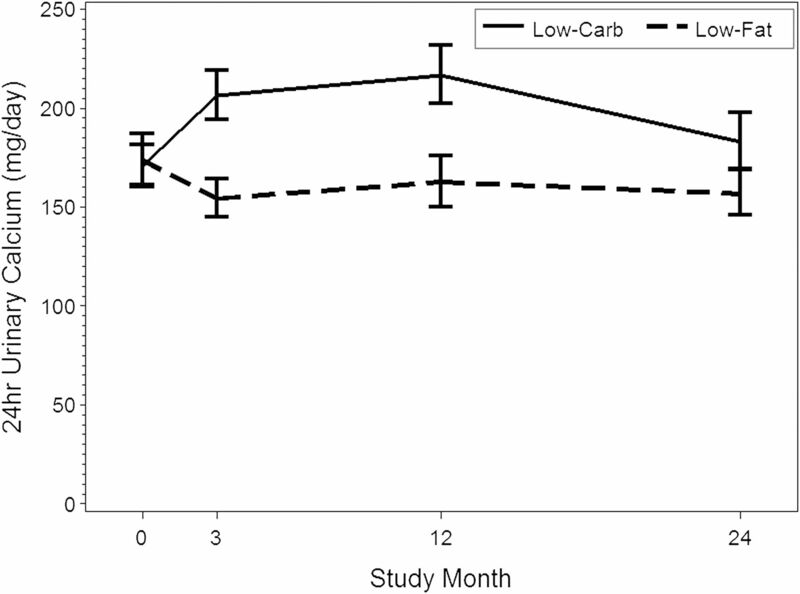 The purpose of this investigation was to assess the relative effects of a low-carbohydrate high-protein versus low-fat diet on kidney-related parameters in obese adults over a 2-year period. We hypothesized that low-carbohydrate high-protein diets would be associated with greater adverse renal effects than low-fat diets. This three-center, randomized, controlled, 2-year trial was conducted between 2003 and 2007. Participants were assigned to a low-carbohydrate high-protein or low-fat, calorie-restricted diet for 2 years. The effect of diet intervention on body weight and cardiovascular risk factors has been reported elsewhere (8). Renal outcomes were assessed at baseline and 3, 12, and 24 months. Written informed consent was obtained from all participants. The institutional review boards of each of the three participating institutions approved the study. The primary inclusion criteria were age 18–65 years, body mass index of 30–40 kg/m2, and body weight less than 136 kg. We excluded study applicants if they had serious medical illnesses, such as type 2 diabetes; took lipid-lowering medications; were pregnant or lactating; or took medications that affect body weight, including antiobesity agents. Participants with BP of 140/90 mmHg or more were excluded regardless of whether they were treated. A total of 307 adults (208 women and 99 men) with a mean age (±SD) of 45.5±9.7 years and a mean body mass index of 36.1±3.5 kg/m2 participated in this study. Participants randomly assigned to the low-carbohydrate high-protein group (n=153) were instructed to follow a diet limiting carbohydrate intake but allowing unlimited fat and protein consumption, according to guidelines from Dr. Atkins’ New Diet Revolution (15). During the first 12 weeks of treatment, participants were instructed to limit carbohydrate intake to 20 g/d in the form of low–glycemic index vegetables. After the first 12 weeks, participants gradually increased carbohydrate intake (5 g/d per week) by consuming more vegetables, a limited amount of fruits, and eventually small quantities of whole grains and dairy products, until a stable diet and desired weight was achieved. Participants in the low-fat group (n=154) were assigned to consume a diet that limited energy intake to 1200–1500 kcal/d for women and 1500–1800 kcal/day for men, with approximately 55% of calories originating from carbohydrate, 30% from fat, and 15% from protein. All participants received comprehensive, face-to-face group behavioral treatment weekly for 20 weeks, every other week for 20 weeks, and then every other month for the remainder of the 2-year study period. Body weight was measured on calibrated scales while participants wore light clothing and no shoes. Height was measured by a stadiometer at baseline. Techniques for BP measurement have been reported elsewhere (8). Serum creatinine was measured using standard clinical assays at each of three participating institutions. Urinary creatinine clearance (ml/min) was calculated by dividing the 24-hour urinary creatinine excretion (mg/d) by 1440 (i.e., min/d) and then dividing again by the serum creatinine (mg/dl) × 100 (i.e., ml/dl). Serum cystatin C was measured at one site using a standard assay (Dade Behring N Latex assay, Deerfield, IL). All participants were given verbal and written instructions on how to perform a 24-hour urine collection. Twenty-four-hour urinary albumin was measured using a standard clinical assay at each of the three participating institutions. Serum sodium, potassium, chloride, and bicarbonate were measured using standard clinical assays at each of three participating institutions. Twenty-four-hour urinary volume and calcium were measured using standard clinical assays at each of three participating institutions. The original study expanded its enrollment goals to provide power for secondary outcomes, such as the renal-related variables described in this paper (8). All statistical analyses were performed with SAS software, version 9.2 (SAS Institute, Cary, NC). Descriptive data are reported as mean and SD or median and interquartile range (i.e., 25th and 75th percentiles) for continuous data, with the latter reported for highly skewed variables. Descriptive statistics for categorical data are reported as the number and percentage of participants. The MIXED procedure was used to fit a series of covariance pattern models (28), a class of linear mixed-effects models, to model the longitudinal values for each outcome of interest over time (baseline, 3 months, 12 months, and 24 months). This modeling approach accounts for missing data due to drop-out or loss to follow-up (requiring the assumption that data are missing at random, conditional on observed responses, but not requiring the data to be missing completely at random) and accounts for the repeated measures within an individual through modeling of the covariance structure of the residual error. An unstructured covariance was used for the residual error and was estimated separately for each diet group. Baseline values were used as the first outcome measure, rather than as a model covariate, which allows inclusion of participants with missing baseline data. Each model was used to estimate change in each outcome of interest between baseline and each follow-up study visit within each diet group and to test for the interaction between diet and change in outcome. An α value of 0.05 was used for each hypothesis test. Results are reported as mean change and 95% confidence interval (CI) within each diet group. Variables that were highly skewed (serum creatinine, cystatin C, urea, 24-hour urinary albumin, and calcium) in distribution were log-transformed for analysis. Estimates from log-transformed analyses were back-transformed and are reported as percentage change. Adding a site effect to the above models did not alter the results; thus, a site effect was not included in the final models. Exploratory models were also fit adjusting for postbaseline BP to assess group difference in kidney-related measures accounting for observed differences in BP. The proportion of participants with missing serum and urine data at each time point did not differ between the two study groups, and weight loss was similar for those with and without serum and urine data collected. No systematic differences were seen in demographic characteristics or measured outcomes between those with and those without serum and urine data collected. 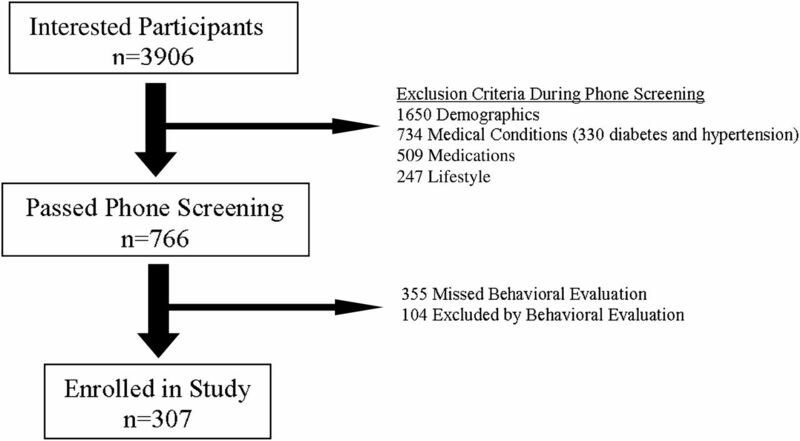 A total of 307 individuals, whose baseline characteristics are shown in Table 1 and who were mostly obese white women, met the inclusion criteria (Figure 1). At baseline, 302 participants had serum data and 233 participants had urine data available. All 307 participants had serum data on at least one study visit, and thus all participants were included in the kidney-related analyses. Two hundred seventy-six (90% of the original cohort), 227 (74%), and 157 (51%) participants had serum data at 3 (low-carbohydrate high-protein, 136; low-fat, 140), 12 (low-carbohydrate high-protein, 111; low-fat, 116), and 24 (low-carbohydrate high-protein, 74; low-fat, 83) months, respectively, whereas 220 (72%) (low-carbohydrate high-protein, 111; low-fat, 109), 155 (51%) (low-carbohydrate high-protein, 78; low-fat, 77), and 122 (40%) participants (low-carbohydrate high-protein, 56; low-fat, 66) had urine data at these respective time points. No significant clinical or biochemical baseline differences were seen between study groups. Mean 24-hour creatinine clearance was elevated in both groups in the setting of normal serum creatinine and cystatin C. Baseline mean urinary volume and serum electrolyte, serum urea nitrogen, and urinary calcium levels were all within the normative range. Only 33 participants (15%) had baseline levels of urinary albumin excretion above the microalbuminuria cutoff (i.e., ≥30 mg/d) (29). Both groups experienced significant weight losses of approximately 9%, 11%, and 7% at 3, 12, and 24 months, respectively. Weight loss did not statistically significantly differ between groups at any time during the study (using a prespecified P value cutoff of <0.01 ) (Table 2). Compared with the low-fat diet, low-carbohydrate high-protein consumption was associated with clinically minor reductions in serum creatinine (P<0.01) and cystatin C (P<0.01) levels at 3 months only and relative elevations in creatinine clearance that lasted up to 12 months (between-group relative difference at 3 months, 15.8 ml/min [95% CI, 4.4–27.3 ml/min]; at 12 months, 20.8 ml/min [95% CI, 8.0–33.5 ml/min]) (Table 2, Figure 2). No differences were observed in 24-hour urinary creatinine excretion. There were no differences between groups in the amount of urinary albumin excretion, with the overall trend being toward reduced excretion regardless of diet (Table 2). Serum sodium, potassium, chloride, and bicarbonate levels did not differ between groups at any time point (Table 2). Serum urea levels were significantly greater in the low-carbohydrate high-protein group throughout the entire study period (relative difference between groups at 3 months, 14.4% [95% CI, 8.0%–21.2%]; 12 months, 9.0% [95% CI, 2.4%–16.0%]; 24 months, 8.2% [95% CI, 0.1%–17.0%]). As described in Table 2, 24-hour urinary volume was increased in the low-carbohydrate high-protein group relative to the low-fat group at 12 (relative increase, 438 ml [95% CI, 181–696 ml]) and 24 (relative increase, 268 ml [95% CI, 1–535 ml]) months. Twenty-four-hour urinary calcium was also relatively higher with the low-carbohydrate high-protein diet at 3 (relative increase, 36.1% [95% CI, 15.0%–61.1%]) and 12 (relative increase, 35.7% [95% CI, 10.7%–66.2%]) months (Table 2, Figure 3). The low-carbohydrate high-protein group had a statistically greater (2–3 mmHg) reduction in diastolic BP (3 and 6 months) and weight (1 kg) (3 months). None of the findings described above were altered after adjustment for these differences or when a site effect was included to allow for differences in laboratory assays between sites. 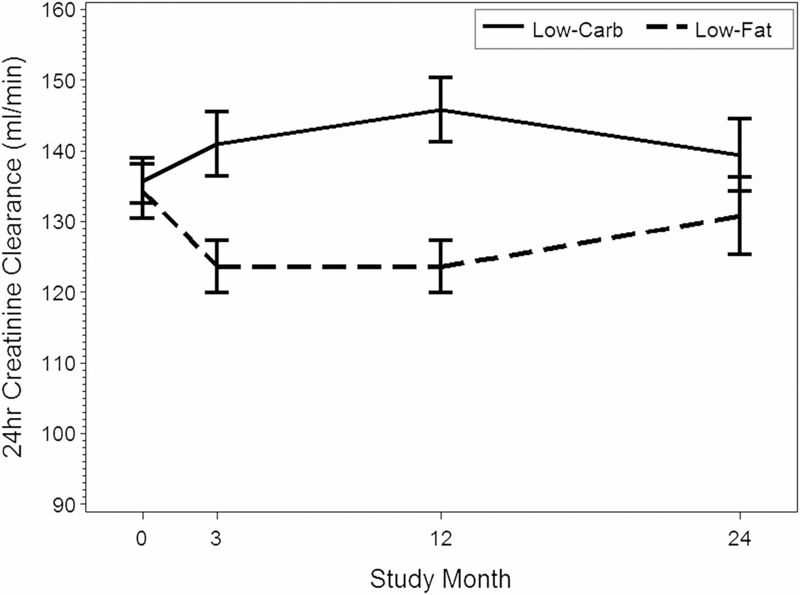 This 2-year study found that a low-carbohydrate high-protein weight loss diet is associated with increases in creatinine clearance, urinary volume, calcium excretion, and serum urea nitrogen when compared with a standard low-fat weight-loss diet. Most of the differences were observed during the first 12 months of the study. There were no differential effects on serum electrolytes and urinary albumin excretion. These findings provide information directly relevant to the appropriate and safe prescription of weight loss strategies. Creatinine clearance is a commonly used clinical surrogate for GFR, a fundamental indicator of kidney function (29). In the steady state and assuming no extrarenal clearance, creatinine excretion by the kidney equals its generation. Creatinine generation is principally determined by muscle mass and creatinine consumption in the form of cooked meat (30), whereas urinary creatinine excretion depends primarily on GFR. The low-carbohydrate high-protein diet was associated early on with a lower serum creatinine level in the setting of unchanged urinary creatinine excretion. This scenario is best explained by the establishment of a new steady state for serum creatinine through glomerular hyperfiltration, which has long been associated with high protein consumption via unclear mechanisms (31,32). Supporting this conclusion is the parallel reduction in cystatin C, which, unlike serum creatinine, reflects glomerular filtration independent of creatinine generation (33). The reverse situation was observed with the low-fat diet, suggesting a relatively hypofiltrating state compared with baseline, most likely because of lower protein consumption (34). The effect on GFR of long-term low-carbohydrate high-protein consumption is of major clinical interest, especially in light of experimental evidence suggesting that protein-rich diets may have adverse effects on kidney health (16,17,35). Moreover, the already high prevalence of glomerular hyperfiltration observed in obese individuals (23,27,29,36,37) could at least in theory increase the susceptibility to diet-associated hyperfiltration-related kidney damage. However, the assumption that prolonged glomerular hyperfiltration leads to kidney damage has never been definitely proven and remains controversial (38,39). In this study, no reduction in GFR (as reflected in surrogate markers) was detected at 24 months in the low-carbohydrate high-protein group, in keeping with previously reported shorter-term findings (13,14). This could be explained by reduced adherence to the study diets, although persistent differences in serum urea levels even at 24 months argue against this possibility. Alternative explanations are that hyperfiltration-related kidney damage is not induced in individuals with normal baseline function regardless of their weight (40) or that more than 2 years or more sensitive markers are needed to detect any detrimental effects. Although we do not believe that the drop in creatinine clearance between 12 and 24 months reflects hyperfiltration-related damage (because creatinine clearance did not differ between 24 and 3 months, the time point at which the effects of a high-protein diet should be highest as a result of maximal adherence), longer-term follow-up is needed to conclusively exclude this possibility. Urinary albumin excretion is another key indicator of kidney health (29), as well as a predictor of major clinical outcomes (19–22). Although high-protein consumption has been demonstrated to increase proteinuria in short-term human trials (18), our study did not find any differential effects between diets on urinary albumin excretion. Weight loss, which was similar between groups, can itself reduce proteinuria (41,42) and probably dwarfed any effects of the dietary components. Thus, there is no indication that a low-carbohydrate high-protein diet had deleterious effects on albuminuria. Low-carbohydrate high-protein intake has been described in some studies as having a multitude of metabolic effects, including natriuresis, diuresis, kaliuresis, and metabolic acidosis (43,44), some of which are related to the ketonemia and ketonuria that arise from a carbohydrate-free or -restricted state. As expected, we observed a rise in serum urea in the low-carbohydrate high-protein group as a consequence of increased protein metabolism (14,45,46). Although we did not measure urinary sodium and potassium, the low-carbohydrate high-protein diet consistently induced greater urinary volume excretion compared with the low-fat group throughout the study period. Although short-term increases in protein consumption alone do not increase urinary output (47), our study participants underwent long-term low-carbohydrate high-protein consumption as well as weight loss, which would increase production and excretion of ketones (early on as described elsewhere ) and protein-related solutes, including urea. Intake of other solutes, such as sodium, commonly found in processed, high-protein products, may also have increased. The ensuing solute load could trigger the thirst reflex and, if the load was too great, obligate water loss. Greater water consumption may explain why weights were not lower overall in the low-carbohydrate high-protein (versus low-fat) group despite higher urine output. Future studies are needed to confirm these hypotheses using more precise urine and serum measurements. Of note, no electrolyte derangements were observed in the low-carbohydrate high-protein group. Although the diuretic and azotemic effects of the low-carbohydrate high-protein diet also had no detectable clinical effects on study participants (8), it is conceivable that susceptible individuals, such as those using diuretics or those with advanced kidney disease, could become symptomatic. The propensity of the low-carbohydrate high-protein diet to increase urinary calcium excretion confirms previous observational and interventional data in lean individuals linking increased protein intake and urinary calcium excretion to a higher risk for calcium-based stones (45,48,49). Urinary calcium excretion is increased through enhanced urinary acid output and GFR, impaired renal tubular calcium reabsorption, reduced citrate excretion, and calcium trapping by urinary sulfate and phosphate (45,50–52). It is also possible that the urinary excretion of negatively charged ketones also contributes by obligating urinary loss of cations such as calcium. Of importance, a low-carbohydrate high-protein diet was not linked to adverse effects (e.g., clinical presentations of new kidney stones or diminished bone mineral density) (8). However, whether such a diet is riskier in higher-risk populations (e.g., those with a strong family history of nephrolithiasis, previous stones, or renal osteodystrophy) is an area ripe for future research. Although the effects of a low-carbohydrate high-protein diet on weight loss and metabolic and cardiovascular risk factors have been extensively examined (1–10), few studies have rigorously investigated its effects on the kidney. Two recent modest-sized randomized trials found that low-carbohydrate high-protein consumption over 6–12 months had no effect on serum creatinine compared with low-fat or low-glycemic diets, but no other markers of GFR, such as cystatin C and urinary creatinine clearance, were measured (13,53). In an observational study of 39 participants (54), a low-carbohydrate high-protein weight loss diet had no clinically significant effects on acid-base or electrolyte status, similar to our findings. A larger study by Rosenvinge Skov et al. randomly assigned 65 overweight or obese individuals to high- or low-protein diets over 6 months (14). The only differences reported were increases in GFR and blood urea nitrogen levels in the high-protein (versus low-protein) group, although the amount of dietary protein in the high-protein group was not as high as that consumed in popular diets or this study. This study has many notable strengths, including a rigorous study design, a large sample size, a lengthy follow-up, a clinically relevant dietary intervention, and a variety of measurements to characterize kidney function and health. In addition, the similar weight losses in both groups allowed us to separate the effects of macronutrient composition from those of weight loss on renal function. Several study limitations also exist. GFR was not directly measured, although our findings are consistent with previously reported effects on GFR (14). In addition, a quantifiable marker assessing adherence to study diets over time, such as urinary urea excretion, was lacking. However, the proportion of participants with positive test results for urinary ketones, a reasonable surrogate for dietary adherence, was significantly higher in the low-carbohydrate high-protein (versus low-fat) diet group at 3 and 6 months (8). No hard clinical endpoints or kidney histologic features were studied because these were beyond the scope of this study. We did not directly measure whether participants properly collected their urine, but the randomization design makes it unlikely that differences observed between groups are explained by collection issues. Finally, although the healthy nature of our obese cohort provides external validity to the nondiabetic, nonhypertensive obese population, it limits extrapolation of results to high-risk disease patients with kidney disease, nephrolithiasis, or related problems. In conclusion, this study, the longest and most comprehensive to date on the effects of a low-carbohydrate high-protein diet on renal function, revealed that the diet was not associated with noticeably harmful effects on GFR, albuminuria, or fluid and electrolyte balance compared with a low-fat diet in obese individuals without pre-existing kidney disease. Additional studies are needed to evaluate even longer-term effects on kidney function and the implications of such a diet in patients with CKD, diabetes, or hypertension, and those at increased risk for kidney stones. The authors thank Daniel Coyne for helpful comments, Joan Heins and Emily Smith for assistance in conducting this study, and the study participants for participation. ClinicalTrials.gov identifier is NCT00143936. The study was supported by National Institutes of Health Grants AT-1103, DK 56341 (Nutrition and Obesity Research Center), and UL1 RR024992 (Clinical and Translational Science Award). A.N.F. was supported by National Institutes of Health Grant K23 RR019615-01. S.K. is the director of the Veronica Atkins Center for Excellence in Obesity Medicine at Washington University School of Medicine, which provides unrestricted funds for community outreach and obesity-related activities.